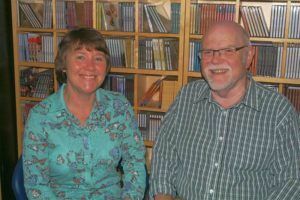 Fellside Recordings was founded by Paul and Linda Adams in 1976. Paul, originally from Coventry, was a drummer and bass player who had played both Folk Music and Jazz; Linda, from Great Clifton (just outside Workington), was a guitarist and singer whose chosen genre was Folk Music. They teamed up as a duo and recorded three albums before deciding to start their own label. They married in 1974 and have two children both now grown up and musicians themselves. Paul had some experience of sound recording and decided that was an area he would like to explore. Their activities as a duo had brought them into contact with recording engineers such as Brian Horsfall (Traditional Sound Recordings), Alan Green (Folk Heritage), Bernard Whitty (Folksound), the legendary Bill Leader and label owner, Joe Stead. All gave considerable help and encouragement. Paul was seconded to the BBC and eventually spent five years in local radio in Cumbria. For many years Fellside was a hobby with only Linda, whose background was in office work, running the administration side of it and working for it while the children grew up. Paul maintained what he calls his “proper” job as a Pastoral Head and Head of Business Studies in a local school. The Folk Music side of the business developed well and the label’s reputation began to grow. Paul had nurtured and ambition to start a Jazz side to the company’s activities and in 1984 the Jazz label, LAKE Records, was formed. The upward trajectory for the company continued and, eventually, something had to go and so both Paul and Linda took the plunge and went into Fellside full-time in 1996. Since its inception Fellside Recordings had been a partnership, but in 2000 it was incorporated and Fellside Recordings Ltd was born. Fellside and LAKE have become two of the leading independent, specialist, labels in the UK with an excellent reputation for the quality of their products. Distribution via Proper Music Distribution has ensured a network of availability to rival any major label. Between them the two labels have received 12 Awards for Excellence from the Music Retailers Association; Fellside artists are regularly nominated for and have won BBC Folk Awards; LAKE has won three British Jazz Awards and Paul was nominated for a BBC Jazz Award, and, in 2015 was awarded the Services To British Jazz Award in the British Jazz Awards. Also in 2015 Paul was awarded an Honorary Fellowship by the University of Cumbria for services to Education and the Music Industry. Some changes to the company came with the introduction of the Smallfolk label which was created to issue the music from the children’s television programme, Bagpuss, the introduction of a more Rock/Indie based label, Midgebitten and the acquisition of the Traditional Sound Recordings and Brewhouse Music labels. There is a publishing side to the business, Fellsongs Publishing. In early 2018 Paul and Linda moved into semi-retirement and moved all the website sales to Propermusic.com where all the releases can be bought.